The shaft of this fish hook, made from sea shell, measures just under three inches. The barb is made of tortoise shell and is attached to the shaft by fiber twine. Also attached to one end of the shaft is a set of glass beads on a fiber string. It was made on the island of Malaita in the Solomon Islands around 1940. These types of hooks have long been used in the Solomon Islands to catch one particular kind of fish, bonito. Bonito are medium size fish that swim in large schools. They are similar to tuna, but smaller. The people of the Solomon Islands have relied on Pacific Bonito for thousands of years and continue to do so today. 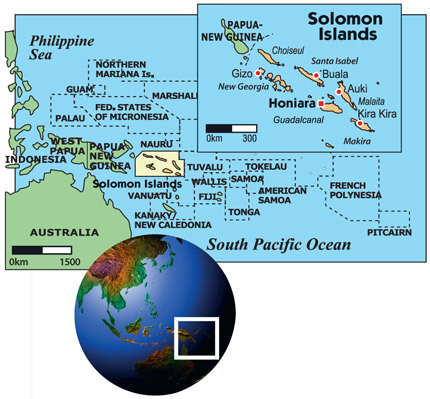 Historically, trolling was the most effective way for Solomon Islanders to catch bonito. Indeed, that is how this hook was designed to be used. They are not meant to be cast and reeled in over and over until a fish is caught. Instead, fishermen cast these hooks out behind their boats and move through schools of bonito. The bonito react to the quickly moving hooks by biting them. No bait is necessary. The action and color of the beads attached to the end of the hook encourage bonito to bite as both mimic distressed or dying baitfish. This hook and the trolling method associated with it is just one of the many unique tools and strategies Solomon Islanders developed to take advantage of the plentiful marine resources around them. While this technique is probably the most ancient among them, others such as kite fishing, might be considered more ingenious. Kite fishing in the Solomon Islands is used primarily for catching small needlefish. With mouths too small for seashell/tortoise shell hooks such as the one profiled here, fishermen of the Solomon Islanders learned to utilize spider webs and kites to catch these fast fish. Watch the video below to learn more about this unconventional fishing technique. This pudding knife was made by the Kwoma culture from the Eastern Sepik region of Papua New Guinea. It is 15.25″ long and 3.25” wide, and it is made out of a tropical hardwood inlaid with small pieces of shell in cross-shaped designs. New Guinea is located in the southwest Pacific Ocean and is the world’s second largest island at more that 1000 miles in length. A central, east-west mountain range dominates New Guinea’s geography. The western half of the island contains the highest mountains in Oceania, with peaks reaching 16,024 feet. These mountains create a steady supply of rain, providing an ideal environment for the island’s highland rain forests. The tropical environment of New Guinea means it is rich in natural resources. The island has an abundance of oil, minerals, gas, timber, and fish. In fact, New Guinea has more wealth in minerals and raw materials than the entire United States, even though the island is only about the size of the state of Texas. Today, most of New Guinea’s natural resources are exported to other countries. For most people in New Guinea the local economy is based on subsistence fishing, hunting, and farming, and is tied to the seasonal cycle. Many indigenous communities do not use paper currency. Instead, they exchange yams, banana leaves, tree pulp, and seashells. The exchange of these items is usually marked by a ceremony or ritual. Sago, a starchy substance originating from the sago palm tree, is an ingredient in many foods in Papua New Guinea. This includes a popular pudding served at ceremonies and celebrations. The pudding knife from the Ethnology Collection would likely have played a role in one of these events. Digging sticks are used to remove the sago pulp from the tree, and the pulp is then washed and filtered through a series of funnels until only the starch remains. The starch is then pounded into a paste that can be used to create the pudding. This carved, wooden dance mask, known as a topeng mask, is from the island of Bali in Indonesia. It represents a devil figure, with flapping ears, a movable jaw, large canines, exaggerated eyebrows and eyes, and an attached moustache and beard. Topeng masks are used in a variety of dances referred to as topeng dances, a dramatic form of Indonesian dance that originated in the 17th Century. It is believed that the use of masks such as this devil mask is related to the cult of the ancestors, which considers dancers the interpreters of the gods. These traditional masks often include several characters: “Topeng Manis” (the typical refined hero character), “Topeng Kras” (the violent, authoritarian character representing power), “Topeng Tua” (an old man who may joke and draw-out the audience), “Penasar” (a buffoon or jokester who often acts as the narrator), and “Dalem” (a sovereign or leader). There is also usually an element of evil, represented through a demon, witch, or other character that must be overcome to achieve the happy ending in the story. This devil mask may represent a character such as Rangda, a fanged child-eating demon from Balinese mythology. In topeng dances, there is an attempt to include all aspects of human nature such as the dualities of the sacred and the profane or beauty and ugliness. A typical performance alternates between speaking and non-speaking characters, and can include dance and fight sequences as well as special effects (sometimes provided by the gamelan, a traditional musical instrument). It is almost always wrapped-up by a series of comic characters introducing their own views, even including current events or local gossip to amuse the audience. There is another style of Balinese mask in the Ethnology collection (Click this link to view: E/1958/24/3). What kind of character do you think it represents? Why? Let us know in the comments or send us a note via e-mail! The history of an object, how it moves from place to place over time, can teach us a great deal about a culture. It can tell us about trade, intermarriage, and, in general, how people and societies interact with one another. This jug is a fascinating case study of how an object can reveal an incredible story. It was purchased on the island of Sumatra in western Indonesia in the 1960’s-1970’s from a street vendor at a camp near the capital city of Pekanbaru. This stoneware jug is made of hard, dense clay that is glazed using a method known as salt glazing. Salt glazing occurs when salt is introduced into a kiln when firing a ceramic vessel. It results in a glassy, mottled surface that makes the vessel impermeable to liquids. This jug is decorated with the image of a “bearded man” figurine, indicating it is a type of vessel known as a Bartmann (or Bellarmine) jug. Originally from the Frechen region of Germany, Bartmann jugs mainly date to the 16th and 17th centuries. They were used for transporting liquids and were traded widely across Northern Europe and the British Isles. The “bearded-man” figure represents a wild man from Northern European folklore and was thought to be a protective figure that warded off evil. In fact, sometimes these jugs were used as a charm against witchcraft! So, how did a German jug for transporting liquids end up in a market in Indonesia, over 6,000 miles away? One possible answer is The Dutch East India Trading Company. One of the first multinational corporations in the world, The Dutch East India Trading Company routinely transported goods from Europe to Indonesia, which was then called the Dutch East Indies, between 1600 and 1800. The islands of Sumatra, Java, Madura, Borneo, Celebes, Maluku, Bali, and East Timor (among others) became the Dutch East Indies, known as the “Spice Islands” for their production of exotic spices such as nutmeg, cloves, pepper, and cinnamon. When these islands came under control of The Dutch East India Trading Company, the company developed world-wide monopolies on these highly desired spices. The city of Pekanbaru was an important trading port for imported objects such as this jug. However, by 1800, mismanagement and bankruptcy resulted in the end of The Dutch East India Trading Company. The Dutch retained control of these culturally and agriculturally rich islands until the mid 20th century, and Indonesia did not become its own country until 1949 following a national revolution. Today, Indonesia represents a crossroads of culture and trade between the Indian and Pacific oceans with more than 300 distinct ethnic groups and more than 700 languages still spoken. This object is a fascinating example of worldwide trade, the introduction of multinational corporations onto the world stage, the spread of cultural ideas, and the legacy of a colonial power.